Nineteen (boxes) times fifty-six (tapes) is a thousand and sixty four. That’s an awful lot of open reel tapes, even if they’re five-inch ones. This is the estimated number of remaining tapes to be processed from a collection of 79 boxes, formerly the property of the late Chris Bard, who presented Sunday morning programmes on BBC Essex for many years (Accession Number SA459). My name is Andy Popperwell and I’ve just become a volunteer in the Sound Archive at the Essex Record Office. 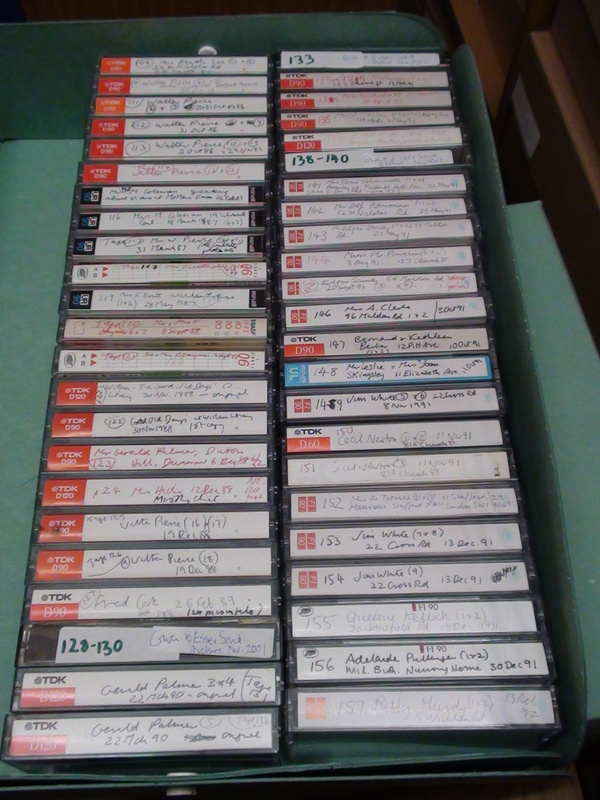 My task is to review these tapes and help to decide which ones should enter the Archive and which ones shouldn’t. The key criterion is whether they have relevance to Essex. Some do; some don’t. I’ve made a start, and the range of material is fascinating. Everything from Polish Christian radio stations after the fall of communism to ecumenism in Essex villages. Learning the archive protocols was the first step. I spent many years as a Studio Manager (Sound Engineer) in the BBC World Service, working on high-speed current affairs in 40 languages, where the pressure was to get the interviews edited as quickly as possible and into the live programmes, 24 hours a day. Here, in the calm atmosphere of the Archive, it’s a question of treating each tape reverently, making sure that temperature and humidity are appropriate and learning how to do a ‘library wind’. This means that, after listening carefully and making notes about the content, each tape is wound back at slow speed so that it’s neatly positioned on the spool and there’s no chance of physical damage. It’s great to be learning new skills while at the same time using my previous experience to help with the work of the Archive. I’m also a volunteer at Copped Hall, on the edge of Epping Forest. It’s a 1750s mansion which was destroyed in a huge fire in 1917, and we’re restoring it. Apart from general labouring, I’m setting up Copped Hall’s own sound archive, trying to record the lives and stories of those who have worked over the last 25 years to rebuild the old place. Do come and visit us on one of our regular Tour Days – third Sunday in the month. Both these volunteering opportunities are feeding into my other big interest: I’ve returned to being a student, doing a Masters by Research at London South Bank University. I’m interested in what Essex in general and Copped Hall in particular sounded like in past times. I hope that, as well as expanding my brain, it will be possible to use my research to recreate the soundscapes of the past, and specifically the 1750s, when the Hall was built. The Essex Record Office has a huge quantity of fascinating material to help with my research, including, for example, little pieces of paper with rhymes and poems which the Conyers family, owners of Copped Hall, wrote for each other in the middle of the eighteenth century (Catalogue Reference D/DW Z3). Handling these documents is a real privilege, and a unique connection with the past. Local radio archives for the promotion of dialogue, tolerance, and peace? 13 February is World Radio Day: an annual day promoted by UNESCO to celebrate radio and the impact it can have. It marks the date in 1946 when the United Nations radio service was established, and it has been celebrated each 13 February since 2013. This year, the theme is ‘Dialogue, Tolerance and Peace’. To Brits in 2019, perhaps this sounds pretentious. Isn’t radio just the poor cousin of television, and haven’t both been made redundant by online media? Who listens to radio now that there are podcasts and streaming music services? To people in other parts of the world, radio can be a significant source of information or an arena to explore different viewpoints. Equally, in the UK, we risk underestimating and taking for granted how much we still get out of our radio service. Tino Morena speaking to Dennis Rookard, SA 19/1/64/1 – come into the Searchroom to hear a sample of the music, which we cannot publish on the Internet for copyright reasons. And then, of course, there are those early Paul Simon tapes, recorded for a folk music programme on Harold Wood Hospital Radio (SA 30/3/3/1 and SA 30/3/4/1 – also only available in the Searchroom for copyright reasons). But local radio stations in Essex also produce meaningful programmes that encourage dialogue, thereby promoting tolerance and peace. One of the most striking series in our archive is part of the BBC’s national ‘Sense of Place’ series, broadcast in 2002. Local radio stations produced a series of programmes about stories of everyday life in their area, which were broadcast on six successive Sundays from 28 April 2002. They aimed to give ‘insights into how different people live’ and explore ‘what makes our different communities distinctive and individual’ (from promotional BBC material, SA 1/2/8). BBC Essex recorded seven programmes in their series (Catalogue Reference SA 1/2). Some of the most striking topics are examined below. In the third programme, producer Anton Jarvis granted insight into an area perhaps few of us have ever experienced: daily life at Chelmsford Prison (SA 1/2/3/1). He spoke to a variety of inmates about their experiences, their first impressions, their hopes for the future. As to be expected, different people had different responses: some created home out of their cells, some did not want to personalise their cells in any way, but just focus on getting to their home outside. Some found it an extremely trying ordeal; some survived by finding humour in the bleak situation. An inmate of Chelmsford Prison hopes for a better life when he gets out. In the final programme, Anton spoke to people in vulnerable housing in Colchester about how they became homeless, what they were doing to survive, and whether they felt any sense of place and belonging (SA 1/2/7/1). Many expressed similar sentiments: they were not really living anymore, just getting from one day to the next, but with little hope because it was so difficult to rise up once you hit rock bottom. Mostly, they felt alienated from the rest of society. Homeless people in Colchester share their experiences – including endless days of walking round town with nowhere to go. These programmes gave voice to marginalised sections of the society. They allowed a close, personal insight into what life is like for other people, views we are unlikely to encounter anywhere else. This is the power of local radio. It continues today. When we consulted BBC Essex about this blog post, they explained some of the challenges facing them in the current politically-charged and divisive climate. …It’s our job as a radio station to remain impartial – but ensure everyone has a voice. Sometimes, when you use interaction as we do a lot on the phones, it can be quite intimidating to listeners to present an alternative view which is opposite to the majority. I spend a lot of time with presenters explaining how to make listeners feel all views are welcome and encouraging a contrary view to air. We compiled a ground-breaking podcast series called Brexit Britain (available here). These are individual stories about Brexit, narrated by ordinary people. Guests ranged from a young supply teacher to a pensioner and a taxi driver to a fisherman. It was the first time so-called immersive podcasts had been commissioned by BBC local radio. Your Essex, presented by Jodie Halford 7-10pm Monday-Thursday, aims to show listeners the sides of Essex they may not be familiar with. Whether that’s race, opinions on Brexit, gender, or class, the aim is to bridge divides. We are working on two pieces at the moment which aim to bring together polarised views. One is a woman whose life has been blighted by a traveller encampment talking one-to-one with a traveller and the other is a woman opposed to the building of a new mosque in the county, talking direct to the imam. The aim of these pieces is to fulfil the BBC’s “inform and educate” remit – as well as provide a rich listening experience. Transmission of these pieces is scheduled for April. While most of our collections come from BBC Essex, we must also celebrate the hard work of community radio stations, including hospital radio – often largely run by volunteers, eager to spread awareness and encourage cohesion within their local communities, as well as seeking to entertain. Most are currently recruiting volunteers if you want to get involved! BFBS Colchester: For Colchester, broadcast on 107. A Global Forces Radio station, BFBS has studios around the UK Garrisons as well as in many other MoD locations around the world. The Colchester studio concentrates mainly on 16 Air Assault Brigade and the three sites controlled from Colchester Garrison: Garrison HQ in Colchester, Wattisham Flying Station and Rock Barracks, Woodbridge. Interview subjects – and their core audience – tend to be serving personnel and their families. They also include veterans, the work of military charities, and work with the Garrison to enhance and publicise events. Colchester is currently working on four separate five-parters on objects held at the Airborne Assault Museum in Duxford, and associated with the 75th anniversaries of, respectively, D-Day, Arnhem, South of France and the Greek atrocities. These will be aired from April onwards. BHR1287: Basildon University Hospital’s radio station. CCR: For Chelmsford, broadcast on 104.4. Colne Radio: For Wivenhoe, broadcast on 106.6. FunkySX: For the Southend area, broadcast on 103.7. Gateway 97.8: For the Basildon / East Thurrock area, who say: ‘At Gateway 97.8, we love celebrating World Radio Day. The theme this year is Dialogue, Tolerance and Peace – our broadcasts throughout February 13th will cover this theme. Make sure you listen to Basildon and East Thurrock’s community radio station to hear the fun things we have planned!’ They are also celebrating Basildon at 70 in their programming this year. Harlow Hospital Radio: Broadcasting to Princess Alexandra Hospital, Harlow. Hospital Radio Colchester: Broadcasting to Colchester General and Essex County Hospital, Colchester. Hospital Radio Chelmsford: Broadcasting to Broomfield Hospital, Chelmsford. Phoenix FM: For the Brentwood area, broadcast on 98. Today’s programmes will include Carmel Jane Talks Business, celebrating female entrepreneurs; popular football show The West Ham Way; and Curveballs, showcasing the best of new music from local bands. Radio Forest: Broadcasting to hospitals in Epping, Saffron Walden, Brentwood, and Harlow. (presented by 11-year old Kara and Kathryn, for the youngsters on Neptune Ward), Sound of the Pirates (presented by Trevor Byford, re-living the offshore sounds of the sixties), plus Musical Moments (presented by Nick Bright and Jonny Buxton, with the smash hits of the stage and screen). As well as being available at Southend Hospital, you can listen live online. The station is a registered charity that relies on donations to stay on-air and fulfil its aims as spelt out in its Constitution: “…To relieve the effects of sickness, infirmity and old age by providing a local broadcasting service to the patients of Southend Hospital”. Today, take some time to tune in to your local station. You might learn something new about your community, you might engage in dialogue with a different sector of society, and you might spread a little toleration and peace as a result. On this World Day for Audiovisual Heritage, our Sound Archivist Sarah-Joy Maddeaux shares news of a new collection of moving stories that have recently been added to the archive. What does ‘home’ mean? What does it mean to be ‘British’? What does it mean to be Black in Britain? What can we learn from our elders? And what does all of this have to do with a Caribbean restaurant in Colchester? We are delighted to announce that we have received, catalogued, and published the interviews created by Evewright Arts Foundation for their Caribbean Takeaway Takeover exhibition. From 2017 to 2018, artist Everton Wright (EVEWRIGHT), staff, and volunteers of his art foundation recorded oral history interviews with 10 elders who moved to the UK from the Caribbean in the 1940s to 1960s. Last summer, on the on the weekend of the 70th anniversary of the arrival of the SS Empire Windrush to Tilbury, Evewright ‘took over’ the S&S Caribbean Café in St Johns Street, Colchester, redecorating the walls and tables with pictures and documents relating to these elders’ lives. Ten-minute segments from their interviews played on a loop in the café, making the exhibition fully immersive. A number of community events encouraged engagement with the exhibition, and thereby with the incredible stories of these elders. The elders generously granted us permission to make their interviews freely available through our catalogue. Search for ‘EVEWRIGHT’ on Essex Archives Online, or type ‘SA 69’ in the ‘Document reference’ box to find all ten interviews. One of the most exciting interviews is that with Alford Gardner. Now aged 92, he is one of the few remaining passengers who travelled on the SS Empire Windrush, the first ship to bring West Indians to settle in post-war Britain. His vivid description of life on board the ship gives an impression of a fun communal experience. His optimism for the future took time to realise, as he faced initial opposition when he tried to settle in Leeds. He was treated very differently in 1948 than when he had previously spent time there as part of the Royal Air Force. Alford Gardner describes the struggle to find accommodation in Leeds in 1948 (SA 69/1/3/1). As a collection, the interviews reveal a number of similarities in the elders’ experiences, but also some significant differences – factors that determined whether their move was overall a positive step, or a negative one which they came to regret. As we might expect, many commented on adjusting to cold, wet England, and coming to appreciate the heating that required houses to have chimneys, which in the Caribbean only appeared on factories or bakeries. Nell Green‘s first impression of the houses in England (SA 69/1/4/1). Some recalled their first taste of fish and chips – but others were glad that they could access London markets to purchase the tastes of home, such as yams, tanier, dasheen, or plantain. Carlton Darrell on fish and chips and the weather (SA 69/1/2/1). In the 1940s to 1960s, British people might have felt like they were being overwhelmed by new arrivals from the Caribbean and other Commonwealth countries, an impression heightened by unfair media portrayals and some politicians stoking fear. However, to the West Indians moving to Britain, black faces were all too scarce. Many interviewees described finding and socialising with other West Indians, particularly in London. Some women became adoptive mothers, inviting young people into their homes and cooking meals for them, helping them adjust to life in this strange, cold country. Was this because it was difficult to make friends with English people? Or was it because we naturally gravitate towards those who share our heritage, with whom we can feel ‘at home’ and recapture something of the country that we left behind? Experiences depended, partly, on the financial position and status of the individuals before they moved. Life was easier for those who had money to spend on decent accommodation. Life was also easier if you already had family in England to support you, or if you found a job that you enjoyed and where you were treated with respect. In contrast, it was most difficult for the earliest migrants, the Black people trying to settle in the 1950s amidst Teddy Boy attacks and ‘No cats, no dogs, no Blacks’ signs. It became a little easier for those who arrived in the 1960s and beyond. Many Black people began purchasing their rented homes using a traditional saving scheme called Susu or Pardnor. This enabled them to become landlords to other Black people seeking rooms to rent. Don Sydney explains the Susu saving scheme that allowed West Indians to support each other in saving up for accommodation and furnishings (SA 69/1/6/1). Yet, sadly, racist treatment was a shared experience right through the time period covered in the interviews, reported to some extent by each elder. Carlton Darrell was dismissive of these examples of prejudice against him (SA 69/1/2/1). Is this because he felt it was inevitable, or because he considered himself fortunate compared to others? Did Britain ever become ‘home’? Yes and no. Some indicated that they still missed their ‘home country’ and wished they could return. Others alluded to a feeling that they were not ‘foreigners’ anymore, but neither were they fully British – even though, coming from Commonwealth countries, they were British subjects before they even set foot on England’s shores. Carol Sydney reflects on what it means to be ‘British’ (SA 69/1/5/1). Overall, most of the interviewees were pleased with how their lives had turned out. Does this reflect the type of person they were? That they took the initiative to move to England, the so-called ‘Promised Land’, in search of self-improvement and a better life? Even if they did not believe the ‘streets paved with gold’ promise, many mentioned that Britain did hold a promise of better education, better jobs, and better salaries. Did this proactive attitude make them more resilient, more likely to be happier with what they have accomplished? Alton Watkins looks back with satisfaction on his life and his accomplishments (SA 69/1/8/1). They certainly contributed to British society. In their work as nurses, teachers, and midwives, they helped produce the next generation of Britain’s workers. They paid taxes. They contributed to the economy. In retirement, they are volunteering in schools, sports clubs, and libraries. However, even now, there is more that these elders can contribute. Most of the interviewees acknowledged a persistence of racist attitudes in Britain, some indicating that it is growing worse. Perhaps the interviews, and the exhibition that was held in the summer, will help in the battle to humanise migrants and demonstrate all that they have overcome in their lives. In this year of the 70th anniversary of the Empire Windrush ship arriving in Tilbury; the 70th anniversary of the foundation of the National Health Service that partly prompted recruitment calls across the Commonwealth; this year of the Windrush scandal, we are grateful to Evewright Arts Foundation for capturing these individual stories that add meaning to national headlines. And on today, the World Day for Audiovisual Heritage, we are proud to play a part in preserving these ‘Moving Stories’ for the future, and in sharing them with you. Read more about the Caribbean Takeover Takeaway or find out more about the Evewright Arts Foundation. All of the interviews can be heard on our SoundCloud channel, or through our online catalogue – search for ‘Evewright’. During our project You Are Hear: sound and sense of place, funded by the Heritage Lottery Fund, we aimed to digitise some 1,800 recordings from the Essex Sound and Video Archive (ESVA), and made them available for free through Essex Archives Online, and on SoundCloud and YouTube. But how does the digitisation process actually happen? Sound technician Catherine Norris, who has ploughed nobly through hours and hours of ESVA recordings to digitise them for You Are Hear, is here to tell us. It’s hard to believe that almost three years have gone by since I started working on the You Are Hear (YAH) project. It’s been a journey that has involved digitising analogue formats using many different vintage players along with digital interfaces to ensure the best digital version of the original source. Over the course of the project I have dipped into many of our Sound Archive collections and by doing so I have learnt a lot about Essex’s heritage though oral history, music, radio broadcasts and videos. I have also enhanced my skills as a sound engineer and as a digitiser. I have enjoyed the many different aspects of working on the project, from being involved in the digitisation process; to giving a speech at the launch of the Essex Sounds audio map; going to see listening bench launches in Galleywood and Chelmsford and chatting to the volunteers involved; and also organising and running a successful sound walk in Chelmsford. YAH project officer Sarah-Joy Maddeaux has kept me busy and given me a steady workflow throughout and chose the content that was to be used on our audio-video kiosks, listening benches and Essex Sounds map. It has been my job to make sure I digitised the content for when she needed it by, so that it could be used for the part of the project that it was required for. There have been different parts to my role, not just the digitisation process – but this is of course an incredibly important part. With everything that I have worked on, if I don’t get that part right everything that comes after it would not have panned out the way it should have done. The digitisation process starts with locating and retrieving the audio and video material from storage, then checking and making sure that it is playable. Once the material has been prepared I check that I have all the equipment that I need to do the job. For digitisation to take place I use a mixture of old and new equipment depending on what the material is that I am digitising. During the course of the project, for the majority of the content I have digitised I have used Denon cassette players, Revox reel machines and VHS players. A VHS player – who remembers these? 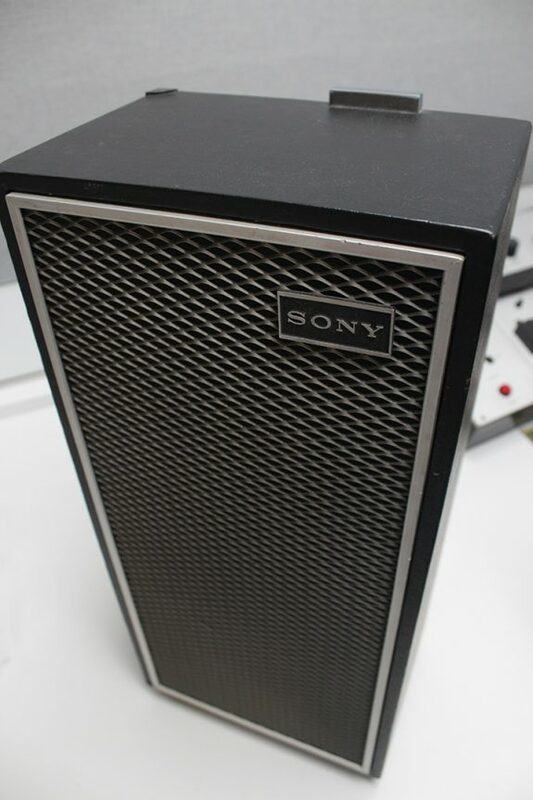 My personal favourite has to be our Sony Stereo Tapecorder (TC-630). It has lots of quirks about it and if a machine could have a personality then this one does, it certainly kept me on my toes whist I was using it! When setting up the equipment I also have to make sure that it is cleaned before placing the material waiting to be digitised onto or into it. To do this I soak a cotton swab in an electronic cleaning solvent and use it to clean the parts of the machine where the tape will touch. It is important to do this before a digitisation but I also do this afterwards so that the equipment is well looked after and so that dirt is not left to get stuck in the tape heads. To turn the analogue signal into a digital signal we use a digital interface. 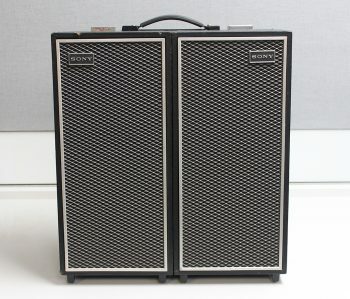 We have two, one for each studio at the Essex Sound and Video Archive. We have the Apogee Rosetta and the Prism Sound Orpheus. 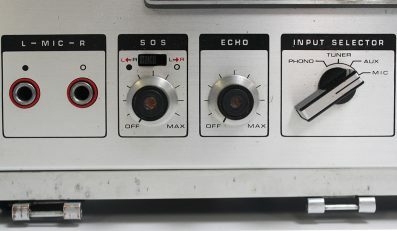 Both of these take an analogue signal (electromagnetic signals on tape) and convert it to digital (a series of 1s and 0s that can be read by a computer). I also use cables, a sound mixer and speakers to hear what I am doing, and a level mixer (Behringer Ultralink Pro) so I can change the signal if it is too high or low. I use a PC and a Digital Audio Workstation (DAW) which allows me to record the digital version of an analogue recording. My main aim is to capture the best version I possibly can of an analogue recording, and the equipment in our studios has made sure that I have been able to do that. With each piece of work once a Master digital copy has been created, an access copy (MP3 for sound, or MP4 for video)) is next to do. I would have to access the original digital version (WAV for sound, AVI for Video) and see if there was anything I could to enhance it using a DAW. For example if there is a lot of distortion I can use various techniques in audio editing software to reduce the effect it has on the recording. Also if needed there are techniques I can use to change amplitude and compression and noise reduction. For the project I have also created digital clips of audio and film if the whole version is not required for the benches and kiosks. I also extract picture stills from films and take photographs and scans of items with picture covers. Throughout all the different processes I collate and write down information about each item. This information is added to a metadata spreadsheet where the information is kept, to help continue monitoring and preserving the digital files. During the project I have dipped in and out of the collection Acc. SA654 which contains boxes of different BBC Essex recordings. A box which I have digitised a few recordings from during the project is Sound Of Essex. As we have come to the end of the project Sarah-Joy and I discussed what I could finish with and decided that this was good box to complete. It is a box of 31 Zonal 675 Five Inch spool, matt backed, standard play 1/4 inch tape reels that contain interesting recordings of people accents from around the county. While I was digitising the reels we thought it would be useful to film parts of the process as a guide to show how I digitised the reels in the Sound of Essex box. Preparing the Reel Machine for Digitisation. Before using a reel machine it must be prepared for use by cleaning the tape heads and areas where the tape and reels will be touching. 2 Clean the spindles, tape heads and all areas where the reel and tape may touch. 3 Use as many cotton swabs dipped in Iso-Propyl alcohol as necessary to make sure that the machine is ready to be used. The tape reel machine is key in providing the analogue signal that needs to be digitised. I place an empty reel on the second spindle. 1 On the first spindle place the reel you wish to digitise. 2 Use the guide table to thread through past the tape heads to and around the empty reel. 3 Make sure both reels are secure and that the centres are locked in place. For preservation purposes I forward and rewind the reel and briefly test the recording levels. 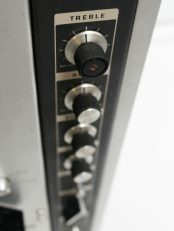 1 The Behringer Ultralink Pro (Level Mixer) to adjust the recording levels. This is connected to the reel machine. 2 The Prism Sound Orpheus (Digital Interface) to change the analogue signal to a digital signal. 3 By using cables the digital signal is sent from the digital interface to the computer and is recorded using a digital audio workstation. 4 Once setup is complete press record on your DAW (Wavelab 8.5) and press play on the tape machine. Once digitisation is complete I can then save my master wav file and begin the next part of the process. Part of preservation for tape reels is the library wind. We do not use the rewind button as we want the reel to be rewound in real time. 1 Take the empty reel off the first spindle. 2 Turn over the full reel and place it on the first spindle. 3 Place the empty reel on the second spindle. 4 Carefully thread the tape thread through past the tape heads to and around the empty reel. 5 Make sure both reels are secure and that the centres are locked in place. 6 Press play and continue until you reach the end of the tape. 7 Tape reel is now ready to be repackaged. We hope that people across Essex, and beyond, will enjoy the results of the You Are Hear project for many years to come! Have you visited any of our listening benches, installed as part of our Heritage Lottery Funded project, You Are Hear: sound and a sense of place? Recently Jade Hunter, a PhD student studying Geography at Queen Mary University of London, embarked on a mini tour of some of the benches to learn more about them. She shares her thoughts on her visits in a guest blog post below. I’m currently studying for a PhD in Geography and I encountered the listening benches when writing an assignment on sound projects. My research interests lie in identity and place, specifically in Essex, so I was really keen to visit and experience benches in different locations. I planned to visit a number of benches which I thought could demonstrate the breadth of Essex as a large, and diverse county. I work in London, and one of the things I’m always struck by is how far away people think Essex is when they live within the (blurring) city boundaries. Visiting the benches highlighted the relationship which parts of Essex have to the city. Audio at the Raphael Park bench suggests that Essex might act as ‘the lungs of London’, and the soundscapes at the Romford, Hadleigh and Chelmsford benches include birdsong, traffic and the sounds of trains delivering people from the suburbs into the city. Viewed from the bench in Hadleigh Park, Canvey Island rooftops were flanked by a ship sailing to the London Gateway super-port, showing a connectedness not just to London, but further afield. View from the listening bench in Hadleigh Country Park. Copyright Jade Hunter. I was interested to hear about the history of the bench locations – listening to villagers of times past speak about specificities of life in Kelvedon, for example. Frank Hume and Ronald Hayward describe their memories of the Crab and Winkle railway line that ran through Kelvedon, a clip from an oral history interview used on the Kelvedon listening bench (SA 44/1/25/1). But I was most drawn to benches with audio about experiences which could be more broadly shared, in locations where it is perhaps more likely that people from across and outside the county would visit too. Perched on a hillside, the Hadleigh bench plays radio clips describing picnics and walks across the park. Feeling connected to the speaker and landscape, I shared the views they described of the estuary and Canvey Island below. This overlap creates connections across experiences, across time. Sometimes, these overlaps can serve to emphasise differences. The first bench I visited was in Chelmsford on a cold morning in February. In a BBC Essex clip from 1992, an optimistic speaker describes the opening of the shopping centre. Sounds of buoyant crowds exploring new shops pin an alternative image over my contemporary view from the bench, the closed shutters of high street restaurants, and wind howling down the shopping streets. BBC Essex report on the opening of The Meadows shopping centre in Chelmsford, used for the listening bench in Chelmsford (SA 1/1030/1). Environmental factors pose risks to the benches which they may not face in museums. Some benches suffered a lack of solar-power, and weather can affect engagement in other ways. I visited the benches in the week preceding the arrival of the snow from Siberia, the ‘Beast from the East’ and so Southend Pier was closed, meaning its bench was inaccessible. There is also an enhanced risk of vandalism. The Bowers Gifford bench is located in Westlake Park, behind quiet residential avenues. It sits in silence, solar panel smashed, demonstrating the risk of liberating installations from museums. However, visiting the benches made me reflect on the difference which hosting oral histories outside of the Record Office can have, contributing to an enhanced engagement and alternative interpretation of the sounds and testimonials. The bench in Raphael Park plays a song, ‘’Owd Rat-Tayled Tinker’ in Essex dialect of the 1920s. The ”Owd Rat Tayled Tinker from ‘Owd Lunnon Town’, sung by J. London in 1906, and used on the touring listening bench while it was at Raphael Park (SA 24/221/1). Broadcast into the park, it can overlay a range of accents spoken by current park visitors. When I visited, this was most notably a man nearby on his mobile, with an Estuary accent like my own. This accent is associated with Romford and other parts of Essex, and influenced by post-war migration from London, as people moved out into the county. My experience of Essex has been shaped by growing up in Thurrock on a suburban council estate close to industrial riverside and the greenery of Rainham Marshes. There are spots where you can see the London skyline, and remain within walking distance of the shopping centre, Lakeside. It’s easy for perceptions of a place to be shaped by media representations, or limited to your own experience of a small section of it. Visiting the benches enabled me to understand more about the variety of landscapes and people that make up Essex, and the ways in which these have changed over time and continue to do so. They made me reflect on those spaces that serve as home to smaller communities, and those which are temporarily shared and experienced by people visiting from elsewhere, the market in Romford, the country park in Hadleigh, and the pier in Southend. Can you get to all the benches? Please note the touring bench that was in Raphael Park has now moved to outside the Finchingfield Guildhall. The touring bench in Hadleigh Park will shortly be moving to Weald Country Park. Find out more about the benches and their current locations on our Essex Sounds website. Then share your #benchselfie with us and tell us which is your favourite clip! Our You Are Hear project officer, Sarah-Joy Maddeaux, reflects on why oral history continues to have value even in an age of high literacy rates and easy access to public platforms. I recently had the joy of running an oral history training workshop, for a local heritage society. I always start with some theorising about oral history: why should we do it, what is its value, what need does it meet? One of the main arguments for taking the time to create oral history recordings has traditionally been that it enables you to add a missing perspective into the historical record. The majority of the records at the Essex Record Office have been created by those in power: government records, church records, estate records of the major landed families in the county. Individuals from the ruled classes might make it into the records, but predominantly in records written about them, rather than by them. Limited literacy, limited access to writing materials, and the process of documents making their way into record offices have generally been given as reasons why the voices of everyday people are hard to find in the archive (though read this interesting challenge of the common assumption that writing paper was expensive). Oral history can change that: any individual can be interviewed about their experiences. It merely takes someone with time and a sound recorder to interview them. Minnie Johnson’s story of her life in a traveller community is unlikely to have been known were it not for this oral history interview – she explains that she taught herself to read from comic books, but cannot write more than her name. The full interview can be heard on Essex Archives Online or our Soundcloud channel (SA 24/1925/1). This is all excellent, and the rise of oral history ran alongside the rise of ‘history from below’ from around the 1960s. Using interviews allows historians to look at alternative histories to political and economic studies. Hearing from ‘ordinary’ people allows you to find out about everyday life for social and cultural history. Or it allows you to study political and economic history from a different perspective: how did the 1930s Depression actually affect people’s daily lives? How did Joe Bloggs feel about international relations during and after the Second World War? Without oral history interviews, these and similar questions would be very difficult to answer. So we happily trot out these examples of why oral history interviews have value for giving a voice to the ‘ruled classes’. But is this as true today? Literacy rates are high (though not high enough). Access to writing material is prevalent. You can go into your local library and use a computer to type up your reminiscences. If you really wanted, you could probably use scrap paper from junk mail received and free pens given out at events to write down your life history without it costing you a penny. What is more, platforms for making your voice heard are much easier to reach. There are social media channels; online petition sites; and file sharing sites that give you free and easy access to voice your opinions. According to the Office for National Statistics, in 2017 96% of 16-24 year-olds surveyed used social media, and 51% of 55-64 year-olds. While there are still barriers to technology, it is much easier to find the views of everyday people. So does oral history matter now, when people can make their way into the historical record of their own volition? Laying aside the (very large!) problem of permanent preservation of online content, I argue that oral history does still, and will continue to, play a very valuable role in filling in gaps in the record. Facebook posts and Tweets tend to be written in immediate response to an event. They represent a person’s immediate reactions. They can be mundane, amusing, fiery, or heartbreaking, but what is written today may not be true tomorrow. They are instantly written, and often instantly forgotten. Oral history recordings are generally collected from people towards the latter stages of their lives. Some argue that this limits their usefulness: you are relying on the supposed frailty of human memory, and on the interviewee reliving events from their current perspective, looking back in hindsight. But this is one of the characteristics that gives the oral history interview its inherent value. From a distance, the interviewee can reflect on events they experienced, what emotions they prompted, and how they reacted. This will give a more balanced insight into which events and experiences were most significant in shaping the individual, and therefore shaping the culture and society in which each lived. Mrs Summers reflects on how she felt about moving to Harlow in 1952, from the perspective of 34 years of hindsight. The full interview, recorded by Dr Judy Attfield, can be heard on Soundcloud or Essex Archives Online (SA 22/1364/1). In fifty years’ time, if you amassed all social media posts I have written in 2017, this would give you one impression of who I was and what happened to me. Interviewing me alongside this data will help to give a fuller picture. Firstly, you can ask me to explain further details. For example, when I posted a picture of a meal I was about to eat, you can ask how representative this meal was of what I ate on a regular basis. As mundane as social media posts can be, oral history interviews will still have value in probing the details of everyday life and culture. Secondly, you can ask me about the events that prompted my posts, and, I hope, you will get a different, more considered insight on what was happening. How will I feel in fifty years about my experiences in 2017? Thirdly, there will always be matters that we do not share publicly at the time, but which we are happy to discuss further down the line. Oral history interviews will perhaps highlight the most life-changing events that are otherwise absent from contemporary autobiographical records. Access to the historical record might be widening, but there is still a place for an oral history interview, where the interviewer can prompt those reflective questions from an outside perspective. Long may it continue. Hear more of Sarah-Joy’s musings on oral history in the Essex Sound and Video Archive at the Essex History Group talk in May. Keep an eye on our events page to book, or subscribe to receive notifications about upcoming History Group talks. If you want to embark on your own oral history interviewing project, the Essex Sound and Video Archive can provide training to help you get started. Please contact us for more information. Rightly or wrongly, Christmas is a unique time of the year, imbued with centuries of traditions, celebrated on a mass level across the country – even the world – but also on an individual level. Each person picks and chooses his/her own customs to create traditions that become more sacred with each passing year that they are observed, passed down through generations and adapted as families intertwine. It has been fun to spend the last few days putting together seasonal recordings from the Essex Sound and Video Archive, as our first ever online audio advent calendar. It provides a chance for you to get a glimpse into the variety of unique recordings in our collection, one day at a time. What does the selection tell us, without giving away too much about future recordings? First, it demonstrates the tremendous variety in the Archive. We have plenty of local radio broadcasts – primarily from BBC Essex, but also recordings for specialist broadcasters such as hospital radio, and talking newspaper magazines. These are an excellent source for finding specific information, local responses to significant national events, such as the 1953 floods, or the 1987 hurricane. They also provide snapshots of the county at moments in time, through BBC Essex’s ‘A-Z of Essex Villages’ or ‘Pub of the Week’ series. We have music, from captivating professional recordings to charmingly amateur ones. Sacred music, carols, folk songs, and fun songs. Music inspired by Essex, and music written on distant shores but performed in Essex. We hope there is something to meet everyone’s taste in our advent collection. One example of the festive music in the Essex Sound and Video Archive, from Day 5 of our advent calendar (SA 10/1/1/19/1). We have public talks and information broadcasts, revealing the history of traditional customs, or useful information on how to get through winter. A large proportion of our recordings are oral history interviews with Essex people. So, secondly, the recordings emphasise the fact that Christmas is a special time of year, by the frequency with which it is mentioned in interviews. Even if the interviewee only speaks for a minute or two, the fact that the interviewer thought to ask about the festive holidays demonstrates its importance. The ways in which people talk about Christmas when they are asked, particularly memories of childhood celebrations, also demonstrate the holiday’s significance. The sense of wonder and delight at this time of year comes back in the voice of the speaker as they recall these memories, even fifty, sixty, or seventy years later. But this sense of delight raises an important question that must always be asked of oral history interviews. How far does the account reflect the reality? There are obvious questions about fading memories, particularly of years blurred together – was Christmas in one family celebrated in 1930 the same way as in 1925? But there are also dangers of thinking all was bright and lovely; there was just the right amount of snow; and we were all satisfied with the orange and new penny in our stocking, and wanted nothing more. Did siblings never argue? Did Mother never burn the dinner? Do Prim Coppin’s memories of playing in the snow mask the bitter cold of the winter of 1947, and how much people suffered to endure it? A clip from an oral history interview from Day 2 of our advent calendar (SA 44/1/12/1). Most people suggest that Christmas in ‘the past’ (that undefined age) was happier. Children wanted less. There was less pressure to strive for perfection, so parents did not overspend. Families enjoyed spending quality time together without television (or smartphones). Communities came together to enjoy carol singing, or skating on the frozen pond. Is this true? And is Christmas really so bad now? And if it is, do we not each individually have the freedom to decide how we celebrate it? What memories will our children recount in fifty years of their childhood celebrations? Thirdly, the collection demonstrates the gaps that are still evident in our archive. The recordings were deliberately chosen as representative of the common ways that Christmas is celebrated in Essex. But what about the many other cultures now living in the county that have their own special high days and holy days? Often these minority cultures are not suitably represented in the archive. If you are a member of a community that does not celebrate Christmas, you can help: you can collect recordings about your customs and traditions. Please do get in touch with us if you want to discuss starting up this kind of project. We hope you enjoy our first advent calendar, and please do let us know if you would like us to do it again in future (resources permitting!). Click here to subscribe to receive daily notifications as we publish each new day’s recording. Many of these recordings were digitised as part of the Heritage Lottery Funded project, You Are Hear: sound and a sense of place. Recently our You Are Hear Project Officer, Sarah-Joy Maddeaux, has been cataloguing a collection of oral history interviews received from Epping Forest District Museum. The interviews were collected in 2004-2005 as part of a Heritage Lottery Funded project, called Changing Perceptions, which aimed to collect everyday accounts to illustrate how life in the district has changed over the twentieth century. Here Sarah-Joy shares some impressions from the recordings. What do a farmer, a dentist, a magistrate, and a blacksmith have in common? No, this is not the start of a joke. The answer is that these were all people interviewed for Epping Forest District Museum’s Heritage Lottery Funded project, Changing Perceptions. The Museum kindly deposited copies of a selection of their interviews with us at the Essex Sound and Video Archive, and I have had the joy of cataloguing them (Series Reference SA 61/1/1). The collection shares all of the wonderful features of any oral history interview: providing an intimate insight into the lives of everyday people, told in their own voices, ranging from amusing anecdotes to heartfelt memories. It also achieves its primary purpose of demonstrating exactly how much life has changed in the last century, even in the last fifty to sixty years. Even taking rose-tinted spectacles into account, a common impression running through the collection is of small towns and villages with a true community spirit, self-sufficient places with a range of shops and services and a real local character. But one of the distinctive assets of this collection is its diversity. The interviewers spoke to a range of people: people from different parts of the UK, in different professions, with different backgrounds and experiences. Listening to these together forms a broader picture of the range of life within Epping Forest. For instance, Bob Willis is a lively, frank character who was born in Suffolk in 1928 but moved to the Gaynes Park Estate, Coopersale when he was nine. He spent most of his working life at Cottis Ironworks. His interview (SA 61/1/1/5/1) gives interesting technical details about his work as a carpenter at the brickworks. It also reveals social information about the relationship between employer and employee.Then he unexpectedly casts light onto significant local events, such as the fire at Copped Hall (though he was not speaking from personal experience). The interview with retired dentists Alain Quaife and Graham Bond (SA 61/1/1/8/1) is very different. It also contains technical information about their occupation, but in the process gives a greater insight into social history. For starters, their accents are more polished: perhaps to be expected from their higher class, more educated backgrounds. They remark on changing trends in dental hygiene, exploring possible reasons for this, beyond better public awareness. While both interviewees have now been retired for over ten years, their comments about how the NHS operates, and the difference between private and public treatment, still provide an interesting insight today. A word of warning, though: some details of treatment, particularly in the early years, are so graphic they may give you virtual toothache. Maureen Chalk (SA 61/1/1/4/1) and Jill Atlee (SA 61/1/1/7/1) both describe working at the Bank of England printing works in Debden, and about the experience of raising children in the area. As Jill’s interview reveals, as recently as the late 1970s, it was the norm that women left work to raise children, perhaps returning to work part-time when their children went to school. But this phase of motherhood provided some opportunities to socialise with other women in the same situation, as Maureen describes. Some of the interviews might stir a response that prompts you to take action. After listening to Joyce Woods talk about her experience of serving as a magistrate (SA 61/1/1/9/1), might you consider volunteering for this valuable work? Do you have the qualities she lists as essential to being a good magistrate? Or listen to the interview with retired farmer John Graham (SA 61/1/1/1/1), recorded in 2004. How does that make you feel about the state of the farming industry in Britain now? The authentic stories of real people can be more persuasive than thousands of words of polemic in a newspaper feature or a commissioned report. Do these interviews change your perceptions? Of Epping Forest, of certain professions, of life in the mid-twentieth century? And does that in turn make you reflect differently on your own neighbourhood, career, life? What will your children and grandchildren think of your Essex? Thanks to our Heritage Lottery Funded You Are Hear project, the full-length interviews can all be heard through our Essex Archives Online catalogue. Contact the Museum for access to recordings not deposited with us. You can get further impressions of how life in Epping has changed by visiting the town’s own listening bench, located in the churchyard of St John the Baptist (St Johns Road off the High Street). Join us for the official unveiling of the bench on Saturday, 4 November 2017, at 3pm – which will still leave you time to get to the firework display of your choice!